A team of 9 artists are sailing into - Portside - Brisbane’s latest social hub this Christmas with the opening of a temporary artist space selling hand-made, one-of-a-kind jewellery, paintings, photography, fashion, digital video, fashion, artist books, purses, and body products. Opening Saturday 8th December, until Monday 31st January, Schmik will allow savvy Brisbanites the chance to buy something extra special for a friend or family member which has been hand-crafted and designed byBrisbane’s most talented artists. and will entertain with snacks, refreshments, free hugs by Molly and Hiromi and some live music. Labels: Brisbane, christmas, jewellery, sale, store, studio sale. jewellery. ceramics. textiles. paintings. The University of tasmania released a new publication this year. 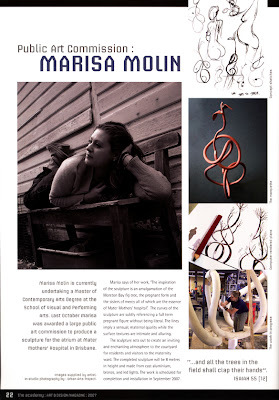 the academy Art & Design Magazine: 2007. This is an exerpt from the publication where I have been included to discuss my first public art commission for the Mater Mother's Hospital. From 27th november - 3 December, I will be in Singapore as a Tasmanian Jeweller representative from the Singular and Multiple Exhibition. Jeanette James and I have been successful in receiving the Artbridge Grant from Arts Tasmania to attend. This exhibition, hosted at Curiocity Gallery, has been picked up and is now an official event for the Singapore Design Festival 2007.